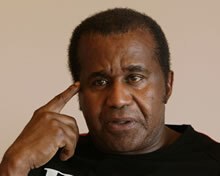 Will Emanuel Steward Ever Set Foot in St. Louis? ST. LOUIS—An interesting fact emerged in June when Don King planned to present IBF 154-pound champion Cory Spinks against mandatory challenger Cornelius “K9” Bundrage in St. Louis: Bundrage’s Hall of Fame trainer Emanuel Steward revealed he has never set foot inside the city of St. Louis. As fate would have it, the fight was postponed, but King this week added the match to his already-loaded “Gateway to Greatness” card at Scottrade Center on Aug. 7 featuring two undefeated world champions. WBC and IBF 140-pound champion Devon Alexander “The Great” (20-0, 13 KOs) will defend against former WBA junior welterweight champion Andriy Kotelnik (31-3-1, 13 KOs) and IBF light heavyweight champion Tavoris “Thunder” Cloud (20-0, 18 KOs) will face the former holder of that belt, Glen Johnson (50-13-2, 34 KOs). But the questions remain: Will Manny Steward, the proprietor of Detroit’s famed Kronk Gym, ever set foot in St. Louis? Will the legendary trainer ever gaze upon the inspiring Gateway Arch? Will he ever sip his favorite beer, Bud Light, in its home city? Could it be that a man who has accepted all challenges, inside the ring and out, has run into a new type of Spinks Jinx? Another noteworthy fact is Steward—for all he has achieved as a boxer, manager and trainer—may be best known now for his longtime role as the premier boxing analyst for HBO Sports. Luminaries of the sport will abound at this fistic explosion. While Steward is training Bundrage, Spinks’ will have a new trainer in his corner, former two-time world champion James “Buddy” McGirt. Since hanging up his gloves, McGirt has followed in Steward’s training footsteps. He has guided notable world champions Arturo Gatti, Antonio Tarver, Vernon Forrest, Tomasz Adamek, Lamon Brewster and Paulie Malignaggi. Steward says Bundrage (29-4, 17 KOs), from Detroit, is younger than his 37 years would indicate due to his brief amateur boxing background. Steward points out that when K2 Promotions (who promotes Steward-trained heavyweight champion Wladimir Klitschko) was looking for an opponent in 2008 to face then-undefeated 154-pounder Zaurbek Baysangurov (19-0, 16 KOs), they selected Bundrage. After traveling to Germany on short notice, Bundrage shocked the Russian by stopping him in the fifth round. “Cornelius has long arms, fights tall and can control a fight with his left hand,” Steward noted. “Not only does he have skills, but he will come into the gym and box 15-to-20 rounds, so he’s in great shape too. Bundrage has always fought for the Kronk Gym but was trained by Steward’s nephew, Javan Hill. Steward has been Bundrage’s manager but will join Hill in the corner for this vitally important match. Steward knows and admires Spinks and thinks he made a good move by hiring McGirt as trainer. “Buddy is a beautiful guy,” Steward noted with enthusiasm. “You know who he reminds me of? He’s just like Muhammad Ali’s trainer, Angelo Dundee. Angelo and Buddy are two of the nicest people I have ever met. When informed of Steward’s kind words, McGirt was appreciative but said it didn’t surprise him. “There is a reason why Emanuel has been so successful, which goes beyond his undeniable talent as a trainer and manager,” McGirt said. “Manny looks for the good in people, not the bad. Both Steward and McGirt enjoyed success as boxers. In 1963, Steward won the National Golden Gloves Tournament of Champions in Chicago. McGirt became IBF junior welterweight champion in 1998 and was the WBC welterweight champion from 1991 to 1993. With Spinks, McGirt believes he’s got an edge in this intriguing matchup. Tickets priced at $17.50, $35, $70, $150 and $300 are on sale at Scottrade Center Box Office, all Ticketmaster Ticket Centers, by phone at 1-800-745-3000, or online at ticketmaster.com. A per ticket facility fee will be added to all tickets purchased at all locations, including at the Scottrade Center Box Office. Additional Ticketmaster service charges and handling fees apply. For disabled seating, call 314-622-5420. The event is promoted by Don King Productions. Doors to the event open at 5:30 p.m.